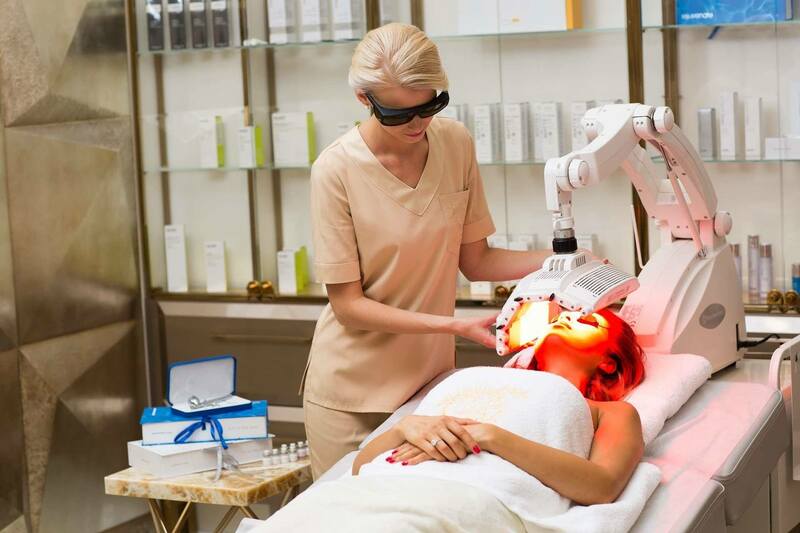 Red light therapy – it’s an anti-aging therapy. The system of light-emitting diodes (LED) fights the aging process and allows the skin to look young during a longer time. How does red light act? This method belongs to non-invasive therapy, which is suitable for both women and men and reduces visible signs of skin aging. This is not laser or intense pulse light (IPL). Rays of red light reduce visible skin lines and wrinkles; naturally stimulate skin rejuvenation while causing absolutely no damage to it. During the first consultation, the doctor will evaluate the condition of your skin and select an individual program suitable for it. The duration of the procedures will be approximately 20-30 minutes. Depending on the skin condition, it will take a course of 6 to 9 procedures to achieve the desired effect. If the procedures are continued every year, their effect lasts longer. Most people notice the effect already after the first procedure. After it, the skin will look cleaner, lighter and smoother. If the skin is dry and tired, 4-6 procedures will be enough to restore it. The exact program suitable for your skin will be drawn up by your doctor during the consultation. You will feel pleasant spirit of warmth as if you were lying on a beach during 20 minutes while being protected from the harmless effect of sun rays. As long as you are enjoying the warmth rendered by the light, regeneration mechanisms will be stimulated in your skin. What kind of light is emitted by the LED system? The red light emitted by the LED system was designed after many years of medical research as a result of the exclusion of a whole spectrum of unnecessary rays and sorting out of a single-wavelength ray. This is a pure, narrow-wave, uniform non-thermal light 633 nm activating skin photo receptors and stimulating the immune function of the skin, which ensures long-lasting improvement after the procedures. The action of this light is scientifically substantiated and patented. The composition of its spectrum contains no harmful ultraviolet (UVA and UVB) and infrared rays. Its action replenishes the natural moisture reserves of the skin allowing it to renew independently and to look fuller and younger. Facilitates preservation of skin elasticity and moisture; prevents formation of wrinkles. Scientifically proved efficiency. Stimulation of rejuvenation (renewal) of the skin. No side-effects and after-procedure period. Non-invasive, non-ablative, natural therapy suitable for those who are not willing to undergo laser and injection procedures. Compatible with skin rejuvenation programmes.